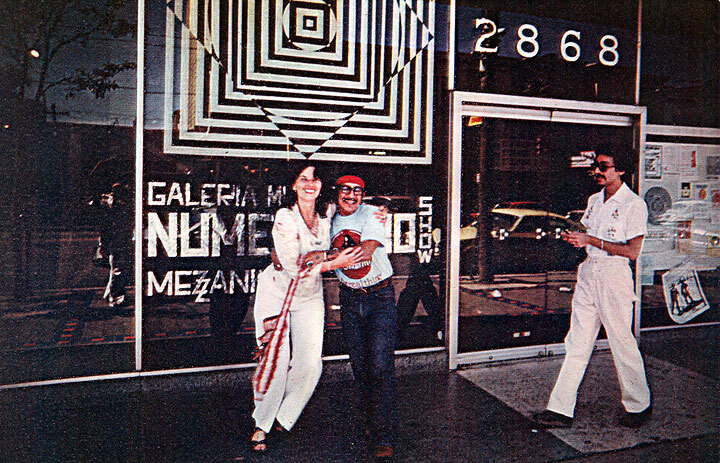 Nina Serrano and Raul Salinas at the Mission Cultural Center, c. 1978. Back in the Mission, the new wave of Salvadorean writers were emerging, with poets like Cecilia Guidos, Jorge Argueta and Marta Ivon Galindo. Piri Thomas returned from New York on the East-West net to la Mission. Latino multimedia groups sprang up with names like Grupo Pedrada, Tupac Amaru, Teatro Gusto and Teatro Yerba Buena. Culture Clash, a ferocious comedy ensemble, hit the streets with rap, sound track and a mod verbal repertoire. Francisco X. Alarcón and I worked on a special issue of the literary supplement to the nation's largest Spanish speaking newspaper, La Opinion which became their first Chicano arts section, published on July 13, 1980. We featured artists such as Gronk, Willie Herron, Patssi Valdez, John Valadez, writer-photographer Harry Gamboa Jr. and music groups such as "The Brat" and "Los Illegals." This effort was followed up in 1982 by El Gallo Ilustrado, a literary supplement of Mexico's periodical, El Día, featuring a Chicano literary special edited by Oscar U. Somoza. The early Mission of personal chapbooks, tight cafe readings, live political rally performance turned to a media theatre format, a textual act enacted through the private readings of an unknown Spanish-speaking cast across nations. By the mid-eighties, the Mission poetic voice catapulted with the young revolution in Nicaragua, the increased struggles of El Salvador, Guatemala and our ongoing resistance to the conservative tightening of the Reagan agenda. 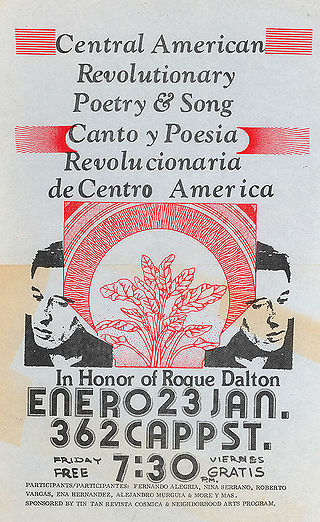 The Roque Dalton Brigade focused on organizing readings to fund the translations of Central American poets into English, specifically Dalton's poems as well as Otto Rene Castillo's writing. This project became the Volcan anthology, published by City Lights. On occasion many of us would merge with other literary events in the Mission such as Steve Abbot's Left Write Conference held at the Noe Valley Ministry on February 14th, 1981. We would co-sponsor events such "The Leash" a Latino play at the Mission Cultural Center by Teatro Gusto, the "In Defense of Free Speech" poetry reading at La Pea in Berkeley with poets including Alice Walker, Karen Brodine, Nellie Wong and Merle Woo. We would read at Casa Salvador on Valencia Street and pay homage those killed in El Salvador's 1979 massacres. The photo images of the caskets of 21 militants were put up on the store front door and flyers and displayed at the fourth "El Salvador" anniversary reading on October 29th, 1983. What exploded in the late sixties and early seventies continued, changed and proliferated through experiment, invention, factional sabotage, global social conflict and ultimately, the re-thinking of sexual orientation and gender stratified voices and communities.